www.newzimbabwevision.com says this ie evil, why should Mugabe, an angel be treated in this manner. Lets be realistic, our darling former president Mugabe never laid a finger on anyone, has never shot anyone, nor stolen a dime,..I mean diamond sorry,..just a sweetheart of the nation. He does not deserve this at all,..Mugabe must flee these Zanu pf mugs and join diaspora Zimbabweans in asylum,..Im just saying! 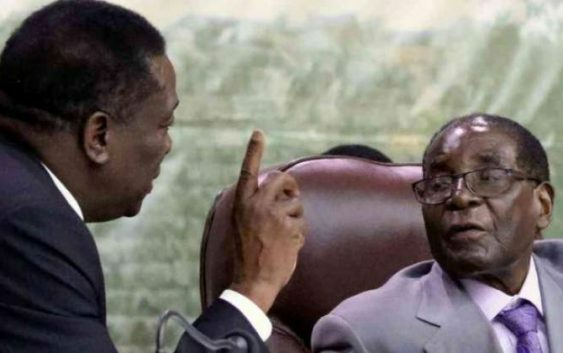 Former president Robert Mugabe has accused his successor Emmerson Mnangagwa’s government of allegedly spying on him and sabotaging his business interests, in the latest sign of a widening rift between the one-time close associates. Mugabe poured his heart out to his friend President Teodoro Obiang Nguema Mbasogo, who jetted into the country on Thursday to try and reconcile the 94-year-old politician with Mnangagwa. The two met for three hours at Mugabe’s Blue Roof mansion in Harare where on Friday the former president also disclosed that he was increasingly feeling unsafe in Zimbabwe. “The old man told president Nguema that ED’s administration was harassing his family and at some point he regretted the good things he had done for the current leaders,” a reliable source disclosed yesterday. “He spoke of how he shaped Mnangagwa and (vice- president Constantino) Chiwenga’s careers by helping them against all odds. “He narrated the source of the problems and what he thinks should be done to restore the relationship. He complained that the military was harassing his “people” and he was unsure of what would become of his family if he was to die “today”. “The purpose of the meeting was for Nguema to get an understanding of how his friend was coping and if he had challenges. “The old man did not hide his frustration with the ED regime and what he had hoped would happen. “He said the regime was blaming every bad thing on him as if he was running the country alone. After the outpouring of emotions, sources said Nguema offered Mugabe refuge if he felt he was not welcome in Zimbabwe. Mugabe reportedly responded by saying “this is my home, I will die here. I will visit you as and when I want to but I will never abandon my people”. “He was told that he should make amends with the current regime and stop working with the opposition as this was destroying his legacy. Nguema, the sources said, also narrated how he survived an attempted coup during the same time Mugabe was toppled. During his 94th birthday celebrations in February, Mugabe complained that he was being mistreated by the new government and said he felt betrayed by Mnangagwa. Nguema was in Zimbabwe on a two-day state visit, which saw him hold talks with Mnangagwa, but sources said the main reason he was in the country was to encourage Mugabe to make peace with the new administration.